The Art Walk project is a stitched landscape that joins several art and media institutions in Grand Center, St. Louis. The current condition of Grand Center allows few moments of connectivity and sense of continuity between urban spaces. 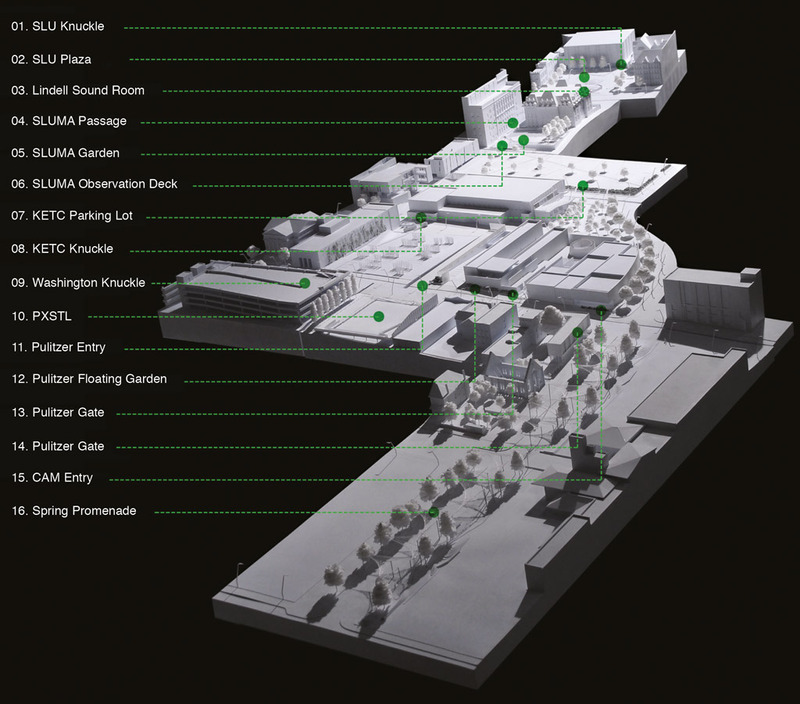 The project is divided into four multi-cultured zones that are currently separated by parking lots, pedestrian inaccessible easements, and gated buildings. The urban strategies are part architecture, art, and industrial design elements. They interface with landscape planning to engage the public in multiple scales of activity in order to bridge between discreet urban spaces. The Art Walk project is a stitched landscape that joins several art and media institutions in the Grand Center area of St. Louis. The current condition of Grand Center allows few moments of connectivity and sense of continuity between the urban spaces. Many American cities face these challenges that evolved, in part, by the predominance of an automotive culture weaving access points and thoroughfares through historically large blocks of public space. In addition, the purposeful labyrinthine management of traffic flows supported a purposeful effort to create defensible enclaves of space around like-minded Institutions. This gating of public space contradicts contemporary thinking, lessening the richness of cross-cultural exchanges and more environmentally sensitive maneuvers through the city. The resultant predominance of the parking lot also creates division, by privileging a population with cars and by creating asphalt islands in-between visitor destinations. Over time these gaps in the urban fabric provide unique opportunities for landscapes within the city that are moments of public assembly and relief from the density of built form. In this way, the dialogue between curated events and an open discussion restores the idea of the city as primarily a social space, representative of plural populations, unique artifacts and stories. Framing these events, the notable building facades provide a visually rich backdrop referencing the cultural ambitions of historic philanthropic efforts to provide access to educational resources. Walking between them is akin to an exterior gallery experience, with the ceiling as sky and the gallery rooms emerging from the urban context. With this analogy in mind, the streetscape of Grand Center, which primarily assumed a utilitarian role, needed to shift its definition from one burdened with connotations of abandoned space to a cultural public right-of-way. 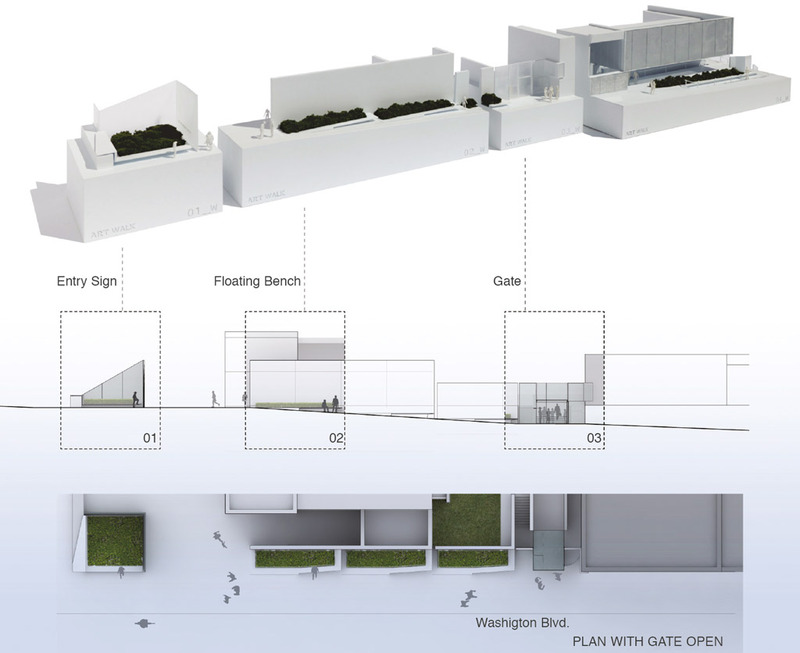 As part of the gallery experience, the walk was designed to evoke a heightened sense of the site (subtle sounds of the wind, presence of the sky, partial views of facades, sense of topography and seasonal changes) in order to encourage pedestrians to be observers and interface with the uniqueness of each urban room. “Urban rooms” are defined as landscape spaces that create distinct territories between existing buildings held within shared public and private zones of streets, parking lots and gardens. These rooms frame the pedestrian flows, legible from above as a dispersal of vector patterns strengthening the connections between institutions, rather than a single flow along a pathway. As each space has unique properties of movement along and through its boundaries, sensors pick up these fluctuations and activate a series of multi-media, sensory and visual effects to metaphorically turn on the lights as one enters the room. At a smaller scale, several places within Art Walk contain “urban characters,” such as telescopes, wind devices, light elements, and rainwater collectors: devices that interface with the urban context. These characters are part architecture, art, and industrial design elements. 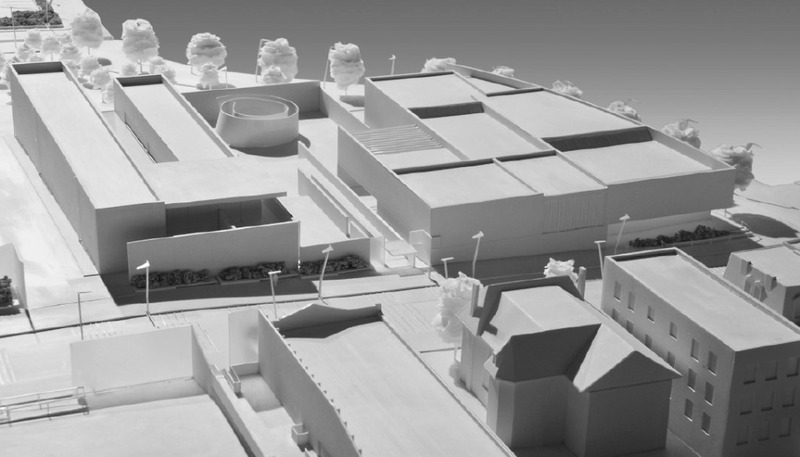 They interface with landscape strategies to engage the public in reading subtle changes to the environment, and recognize dispersed connections within the city. Primarily, we desire to turn parts of the city to interior rooms, working with the existing fabric to frame gateways and thresholds, with minimal intervention performed by the connectors. In recognizing that the limited green spaces in Grand Center are maintained through less sustainable practices, this project seeks to promote a robust environment of indigenous plantings that establish a fluid landscape with competitive growth among plants and a variegated ecology. Dispersed among these natural plantings are “islands” of more manicured elements, referred to as floating gardens. These mounds create an artificial ground, change the horizon, provide a place of rest, and soften the horizontality of the continuous ground-scape. They stand out as unusual elements, thus signaling a portal into passageways and working to hold the necklace of spaces together as part of a larger system. The parking lot territories present unique challenges to the landscape. 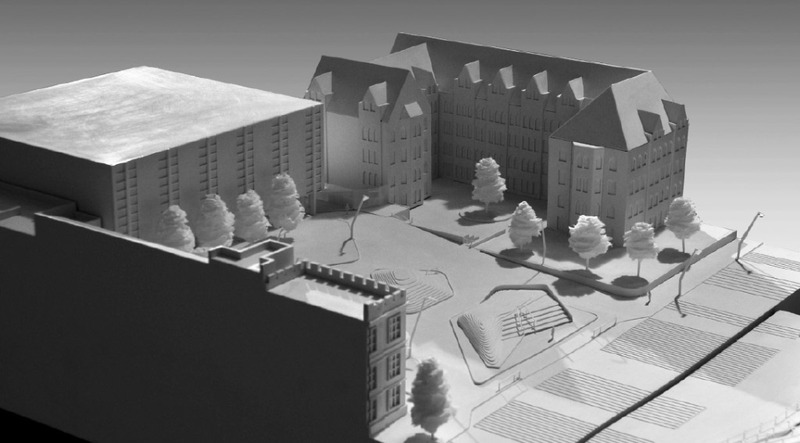 On one side, the number of institutional events justifies maintaining the lots, and in contrast, the community desires an integrated design approach that transforms surface lots into sensitive components of exterior space. If one looks at the transformation of the urban space over time, these lots could naturally “decay” into landscapes through a select series of cuts and disruptions. As a first act, we considered the large lot adjacent to the lowest elevation of the district to primarily address the issue of rainwater collection. A series of cut channels collect water, run through street landscape elements, with a final dispersal at the rainwater retention site. In the context of the city grid geometry, the landscape provides relief, a new geometry and transitional material, transformative and invading the static street. The Art Walk project aspires to activate and transform an urban space over time through the complexity of competing interests and changing infrastructures. 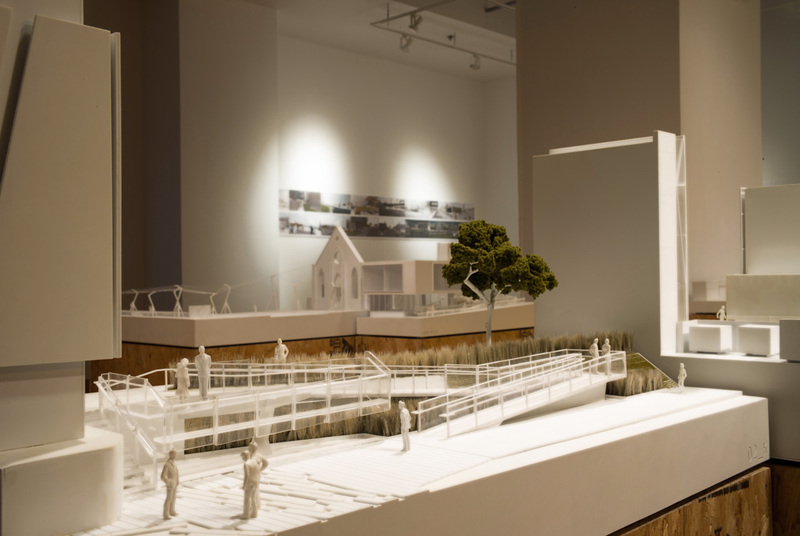 At one impetus, seven private owners and local government came together to reimagine their connective property. Their conversations and agreements will shift, the specific details of the architecture will modify, but the relationships between them will never be the same for a moment of shared vision. Combine this with citizens appropriating spaces, claiming joint interest in their city to create transformative relationships; the project’s realization is found somewhere in this momentum of reimagining urbanity. 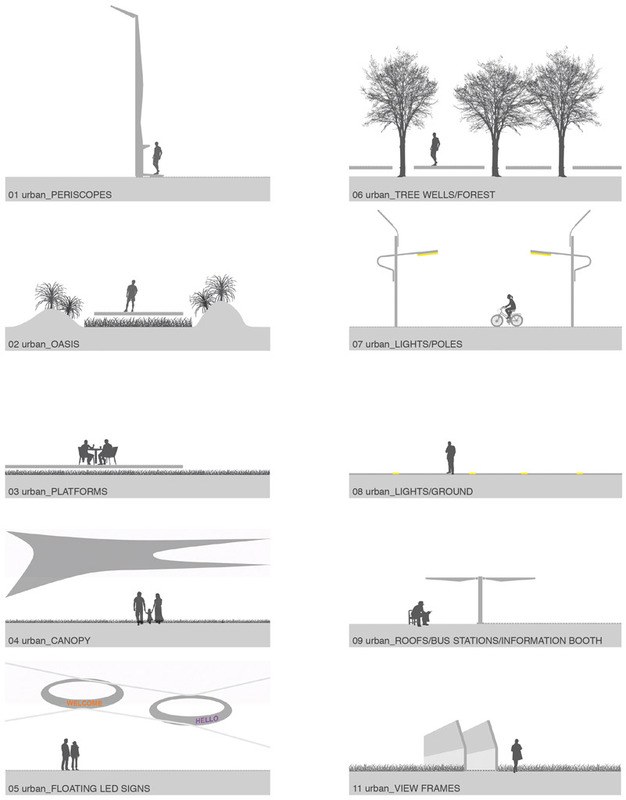 Diagrams of urban landscape elements (I). 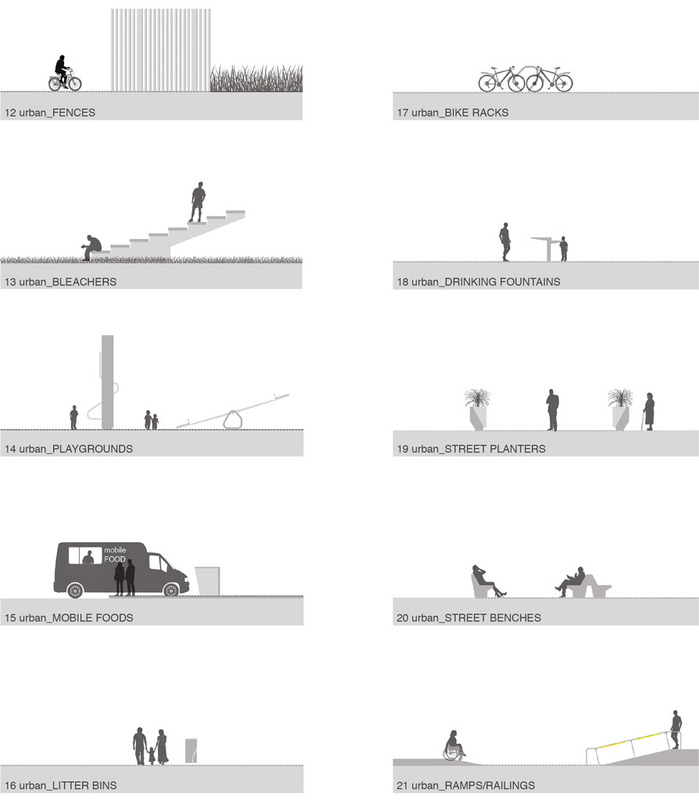 Diagrams of urban landscape elements (II). 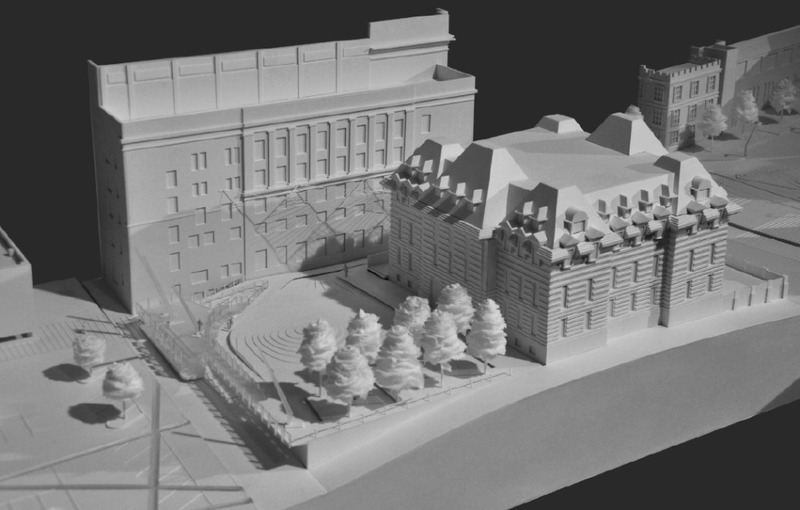 Site model, 3/32”:1” (1:128) scale, 8’x20’ (2.4x6 mt) overall dimension. 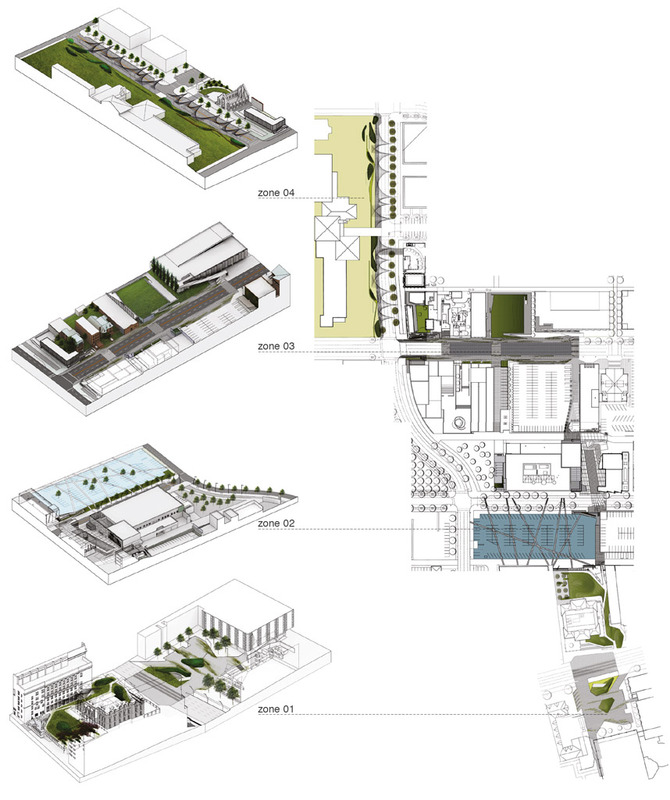 Site plan with the four zones.. 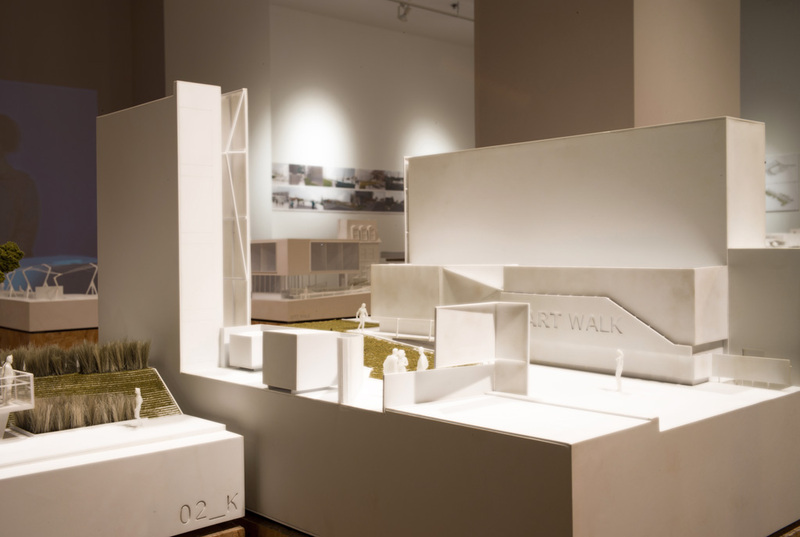 Detail model, ¼”:1” (1:48) scale, and drawing of entry condition at Pulitzer Arts Foundation and Contempoary Art Museum. 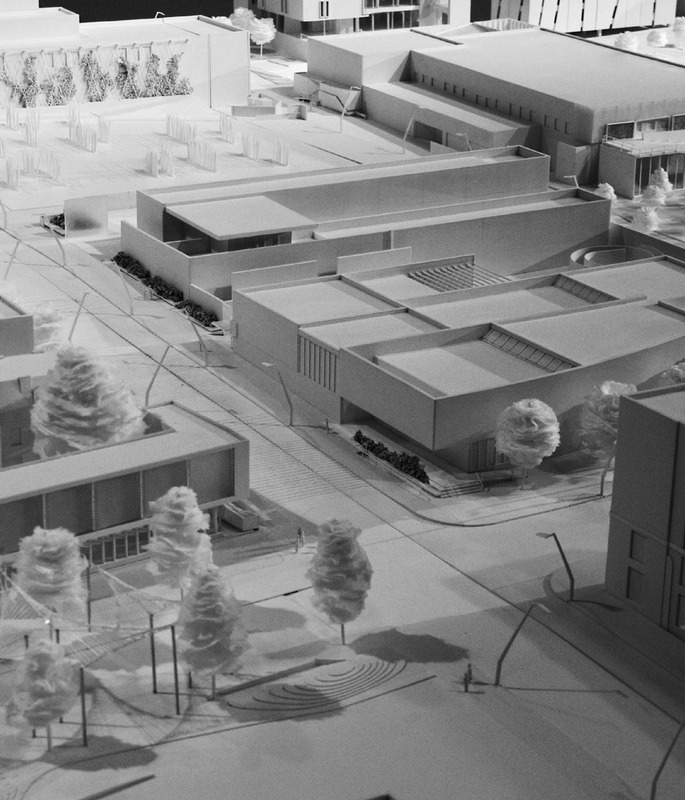 Detail model, ¼”:1” (1:48) scale, of Olive Street entry at Pulitzer Arts Foundation and Contempoary Art Museum. Detail model, ¼”:1” (1:48) scale, and diagram of reflective canopies. 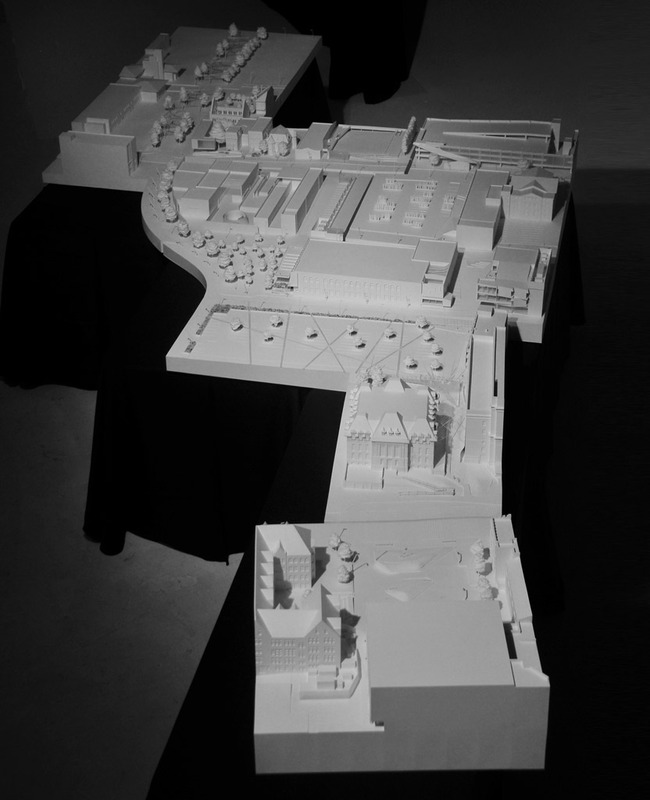 Detail model, ¼”:1” (1:48) scale, and diagram of floating platforms and raised paths. Detail model, ¼”:1” (1:48) scale, and diagram of landscape topography. Detail model, ¼”:1” (1:48) scale, of floating platforms and raised paths. 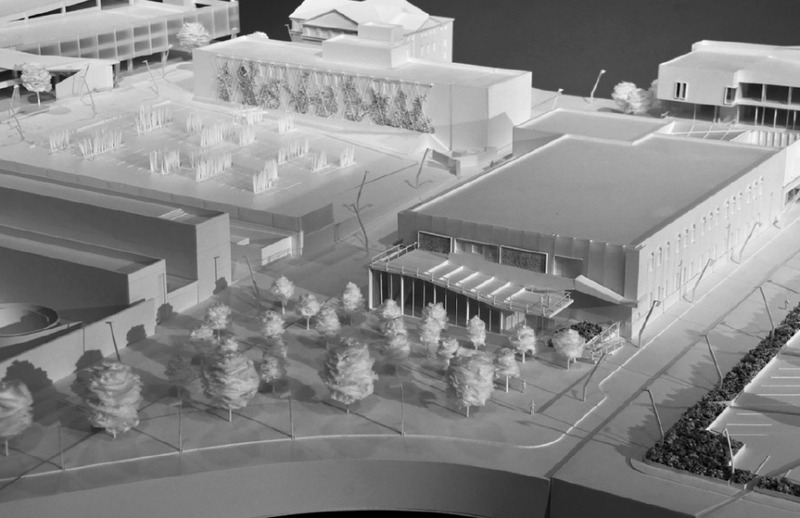 Detail model, ¼”:1” (1:48) scale, of Sheldon Art Museum and Nine Network knuckle connection. St. Louis University (SLU) zone. SLU Museum of Art and Scottish Rite zone. Nine Network public television zone. Contemporary Art Museum, Pulitzer Arts Foundation zone. Contemporary Art Museum, Pulitzer Arts Foundation and reflective canopy zone. This project has been previously published, with a different selection of illustrations and an abridged text, in: Woofter, Heather, and Sung Ho Kim. Axi:Ome llc. Seoul: 3C Publishing Co., 2016. Heather and Sung Ho are founding directors of Axi:Ome llc of St. Louis (USA) since 2003.